Cover image via Chelsea Green Publishing to help you find it in the bookstore. 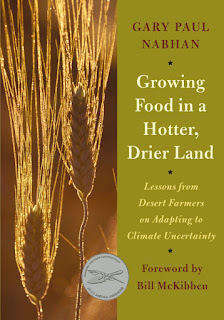 I picked up Gary Nabhan's book, Growing Food in a Hotter, Drier Land: Lessons from Desert Farmers on Adapting to Climate Uncertainty (Chelsea Green, 2013) while doing research for another project. Nabhan, a recognized pioneer in the local-food movement, researcher, and teacher, is a fount of knowledge. This book is just one of 24 he's written covering various angles of the topic food and that doesn't include the countless articles and presentations he's produced as well. I've got one more book on my shelf and my eye on one or two others. 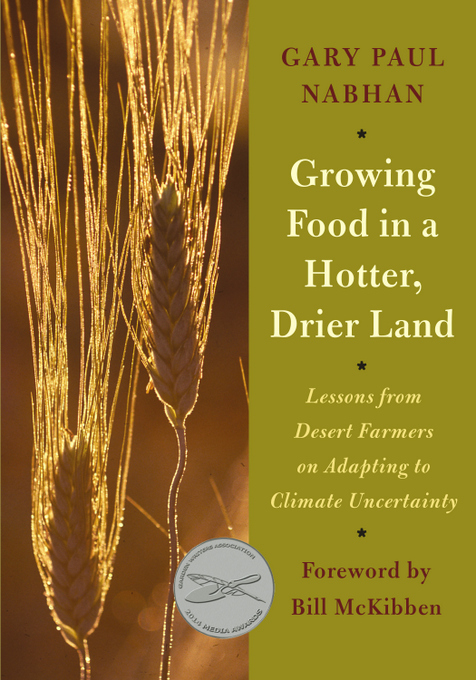 Growing Food in a Hotter, Drier Land is full of straight-talk about climate change and its impacts along with ways to contend with them. Nabhan is quite right in pointing out that our understanding of how to grow food is going to have to change as the climate shifts around us. The news about climate is not uplifting, as we well know, but Nabhan sees plenty of solutions, which makes this a refreshing and inspiring read. Each chapter outlines a tried and true method (ollas, green curtains, intercropping, nurse plants, and terracing to name just a few), its history, how it works, and, perhaps most importantly, why it works. The methods are fascinating and clever as one might expect for something developed, in may cases, over thousands of years. Their simplicity is as astounding as their effectiveness. Ollas, for example, are unglazed ceramic containers placed underground near the root zone of plants. Filled with water periodically, they slowly release moisture where plants need it most. Other techniques - waffle gardens, bush weirs, and micro-catchments - can be implemented on large or small scales to bring water and nutrients where they can be used most effectively. Nabhan also puts forward in each chapter an excellent list of things to be done. These include instructions on how to set-up a green curtain, define your food shed, and how to terrace your fields. There are ideas enough in this book to keep gardeners and farmers of any size or location busy improving the sustainability of their growing space whether it is a handful of pots or a fair amount of acreage. Growing Food in a Hotter, Drier Land is well-worth the investment, and I'm glad to have it as part of my resources beyond the current project. As climate change progresses, this will be a book to have on hand in the survival library.